When it comes to my little one, everything matters. Being a working mother, time is a luxury to me. 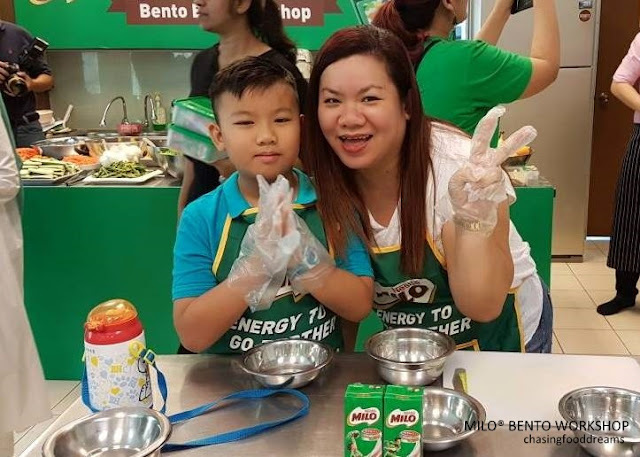 A few Saturdays ago, I was thrilled to be joined MILO®’s Pack in the Energy for Champions Bento Box Workshop with my little one. The room was bursting with much excitement and energy that morning. Parents and their children gathered early, enjoying a light breakfast before the event took place. Of course, we enjoyed one of Malaysia’s favorite leading nutritious chocolate malt MILO®! MILO® was introduced in 1950 and is packed with natural goodness of malt, milk and cocoa, enriched with Activ-Go®; a unique blend of vitamins and minerals. Packed with all the goodness and energy to kick off your day, MILO® has been fueling generations of champions since then. The event took off with a talk on nutritional value of different food and how to prepare a healthy and balance meal for kids by Georgen Thye, a council member of the Malaysian Dietitian Association (MDA). While we all know that breakfast is one of the most important meal of the day, finding time to enjoy a nutritious and healthy breakfast is nearly impossible with our hectic work schedules and lifestyle. A balance breakfast can boost the energy level we all need to kick start our day, therefore, it is crucial that we do not skip this meal. Even if time do not permit, we can still grab easy to-go food and beverage or simply prepare our breakfast the evening before. Thye cited that one in three children were found to have low physical activity level, noted among breakfast skippers, from the findings of MyBreakfast Study carried out by Nutrition Society of Malaysia (NSM). He proceeded to inform us that skipping meals or poor food choices will lead our children to be energy deprive throughout the day, thus affecting their focus and attention levels during classes and activities. A healthy balance meal should consist of fruits, vegetables, lean meat, whole grains, legumes, dairy, nuts and seeds as advised by Thye. He proceeded to conduct a demonstration on 3 simple and easy 15-minutes recipes for healthy meals to pack for the children. When it comes to creating bento boxes, we were also joined by Hasnawati Yahaya a member of the Kelab Bento/Bekal Malaysia, who showed us how to make pretty and fun bento boxes with the 3 recipes by Thye. First recipe Thye made Whole Grain Tortilla Chips with Pumpkin Tuna Mash. Not only is it healthy, its easy to whip up and can be prepared in advance with minimal effort. Pumpkin is easy to cook and can be steamed or microwave till soft. Mix the pumpkin with drained tuna from can, add in a margarine, season with salt and black pepper and top with spring onion. Tortilla chips can be baked or microwave till crispy. Hasnawati then proceeded to show up how to make this recipe super cute to entice the little ones to enjoy their bento box. Using toothpick, its really easy to cut out the shape of a bunny from a slice of cheese. Add in some fruits and a pack of MILO® and this balance and nutritious packed bento box is done! The next recipe was Hawaiian Pasta Salad. It’s a great recipe to get your children to eat some vegetables since most little ones like pasta. Thye uses wholemeal pasta to add on extra goodness. Cooked the pasta according to the package directions and rinse in cold water. Add in drained canned tuna, shredded carrots chopped pineapple for sweetness and a light dressing of light mayonnaise some Greek yoghurt, lemon juice and season well. Hasnawati added an adorable kitty cat and fruits to complete the bento box along with MILO®. The final recipe is a Banana Peanut Butter & Pumpkin Seeds Open Sandwich. Simply spread peanut butter on wholemeal bread (toasted or not), topped with sliced banana, sprinkle with pumpkin seeds and drizzle with a little honey. Add a super cute bear cut out from sliced bread, fruits and a pack of MILO® for the finishing touch. Then it was our turn on get creative with our own bento box. A lot of ingredients was provided and me with the little one put on our thinking caps. We made two bento box, one with our family sleeping on a bed made from bread and a blanket of cheese. The second one we made about Olaf from boiled egg and fruit, add in some of that pasta salad and slices of lean grilled chicken breast with fresh berries. There were also a lot of other great bento boxes from the rest of the parents and their children. The judges were Angeline Lim, Senior Brand Manager of Nestle Malaysia with Thye and Hasnawati as well as all the children present that day. “Our kids are our champions and it is important for us to give them all the support they need to take on their daily challenges. That is why we encourage parents to provide their children with a balanced home-packed meal paired with a MILO® UHT to take to school, which helps to efficiently release energy from food. This gives their children the energy to go further and to perform at their best – mentally and physically,” said Angeline. My little one and me managed to snag the winning prize of the day with our Olaf bento box! Congrats to all the other parents and children with all their lovely bento boxes too as they were all made with much love together. The most important thing that came out of that day was spending time with my little one and learning how to pack him a balance meal with MILO®. MILO® UHT, always convenient and easy to enjoy, helps working parents like us to ensure that our children are enjoying a balance diet and adequate amount of energy to get through their day. Now that’s what I call Packed with Love!